Should Easter Eggs be banned to encourage healthier lifestyles? This week in community circles we have been debating the controversial issue surrounding easter eggs vs healthy eating. 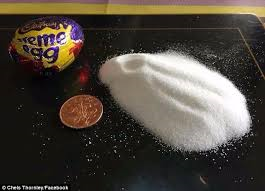 Did you know there was this much sugar in just one crème egg…..?